Clouds linger unexpectedly on Saturn's Moon Titan. There arehundreds of millions of miles of the void of space between climate scientistsand Saturn's frigid moon Titan. But in spite of the distance, the scientistsnearly got it right when they made a model of the moon's climate. The onlything off was the timing. 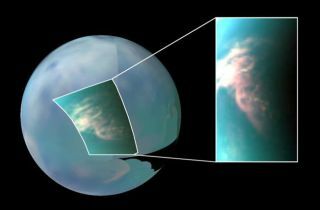 Scientistsfound that the way cloudsare distributed around Titan mostly matches their models. Contrary topredictions, however, clouds still have not dissipated from the southernhemisphere as the moon's fall season approaches. ?Titan?sclouds don?t move with the seasons exactly as we expected,? Sebastien Rodriguezof the University of Paris Diderot, who works with the Cassini mission, said ina statement. The newimages are from Cassini, the probe that has observed Saturn since 2004. In thattime Cassini has peered through Titan?s cloud cover and at the cloudsthemselves. In a renewed effort this year, the probe has gathered a new wealthof information about the moon in six flybys since February 7. The next flyby isscheduled for June 6, the Jet Propulsion Laboratory in Pasadena, Calif. reported. Cloudsgather densely over the moon's southern hemisphere during its summer, andCassini has shown that the cloudy skies persist at least into the early fall. Theyare expected to clear by August. ?It lookslike Indian summer on Earth, even if the mechanisms are radically different onTitan," Rodriguez said. He revised Titan's early Autumn forecast,predicting warmer and wetter weather than what the models have called for. Warm is asubjective term on Titan, where the average temperature is -290 degreesFahrenheit (-179 degrees Celsius). One measure of the cold there is itsvolcanoes. While those on Earth spew molten rock, liquid water streams fromTitan's volcanoes. In spite ofthe brisk weather, Titan, is one of the most Earth-like worlds scientists havefound to date, NASA reports. It has a thick atmosphere and the right chemistryto support some forms of life. It actually resembles a frozen version of Earth,several billion years before organisms here began pumping oxygen into ouratmosphere. Cassini has revealed a surface carved by rivers and lakes of liquid ethane andmethane (the main component of natural gas). The liquids evaporate and condensein the atmosphere like water does here on Earth. Also like Earth's water, theethane and methane formclouds and rain from Titan's sky. In thisyear's series of flybys, Cassini is monitoring Titan's atmosphere and surfacefor signs of seasonal change. And NASA scientists say they await new data thatcould confirm the presence of a liquidocean beneath the moon's surface.